The XbelWriter class is a subclass of QXmlStreamReader, which provides an XML parser with a streaming API. 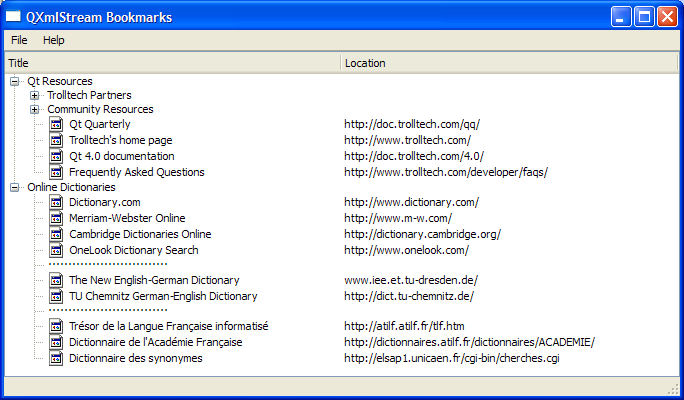 XbelWriter also contains a private instance of QTreeWidget in order to display the bookmarks according to hierarchies. 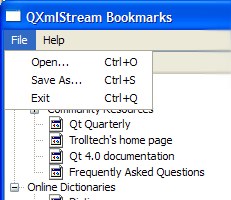 The writeItem() function accepts a QTreeWidget object and writes it to the stream, depending on its tagName, which can either be a "folder", "bookmark", or "separator". The XbelReader class is a subclass of QXmlStreamReader, the pendent class for QXmlStreamWriter. 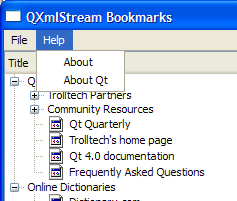 XbelReader contains a private instance of QTreeWidget to group bookmarks according to their hierarchies. The read() function accepts a QIODevice and sets it using setDevice(). The actual process of reading only takes place in event the file is a valid XBEL 1.0 file. Otherwise, the raiseError() function is used to display an error message. The readUnknownElement() function reads an unknown element. The Q_ASSERT() macro is used to provide a pre-condition for the function. The readXBEL() function reads the name of a startElement and calls the appropriate function to read it, depending on whether if its a "folder", "bookmark" or "separator". Otherwise, it calls readUnknownElement(). The readSeparator() function creates a separator and sets its flags. The text is set to 30 "0xB7", the HEX equivalent for period, and then read using readElementText().